How long can we ignore these broken segments of our population and at what cost? 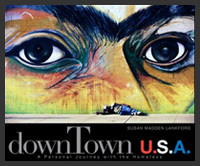 In downTown U.S.A: Personal Journey with the Homeless, photojournalist Susan Madden Lankford takes her cameras onto the streets of downtown San Diego, introducing her readers to a diverse cast of characters and a challenging set of questions that shine new light on the difficult issue of homelessness. 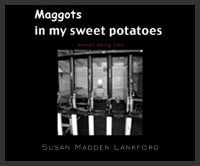 The first in a photojournalistic series that addresses the social issues of child abuse and neglect, homelessness, incarceration, and the special needs of women behind bars, Maggots in My Sweet Potatoes: Women Doing Time offers an in-depth and illuminating look at the lives of incarcerated women. The final volume in the series—Born, Not Raised: Voices from Juvenile Hall—explores the troubled psyches of incarcerated young people. Poignant contributions from the youths are featured in the book, along with the perspectives of psychiatrists, neuroscientists, and experts in the field of juvenile justice. Kids who circle in and out of juvenile hall are mostly termed "at risk." They are at risk of not finishing school, falling into a life of drug addiction or crime and winding up behind bars as adults. Photojournalist Susan Lankford spent two years visiting a San Diego jail, photographing and speaking candidly with inmates and staff. These books belong in every public and school library.